Leinfelden-Echterdingen,- Creaform, leader in portable 3D measurement solutions and 3D Engineering Services, announces the installation of probing and non-contact 3D measurement systems at the BMW plant in Munich, Germany. The TRUaccuracy technology which is integrated in all Creaform systems is a key factor that contributed to convince BMW. 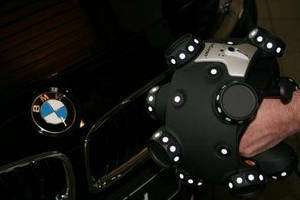 Since October of 2012, the BMW plant in Munich has been using the MetraSCAN 3D optical CMM 3D scanner, the HandyPROBE arm-free CMM and the EXAscan portable self-positioning 3D scanner from the Handyscan 3D product line. The Creaform solution has been chosen for the coherent package of flexibility, measurement speed and accuracy, ease of use and the possibility to integrate it seamlessly to existing structures. The systems are used for the evaluation of supplier parts, body circumferences and entire vehicles. Thanks to the TRUaccuracy technology, integrated in all Creaform systems and which features capabilities such as dynamic referencing, automatic drift detection and alignment, measurements can be taken directly on the vehicle, without having to jack it up and secure it. Vibrations caused by instabilities of the measurement setup do not affect the accuracy. Thus, the use of flexible measurement systems with the TRUaccuracy technology leads to time and money savings in the measurement equipment and environment and ultimately to higher productivity. Like the BMW plant in Munich, BMW Rosslyn in Pretoria, South Africa has been using the HandyPROBE portable coordinate measurement system since 2011. Creaform develops, manufactures and sells 3D portable measurement technologies and specializes in 3D engineering services. The company offers innovative solutions such as 3D scanning, reverse engineering, quality control, non-destructive testing, product development and simulation. Its products and services are intended for industries such as the automotive, aerospace, consumer products, heavy industries, health care, manufacturing, oil & gas, power generation and research & education. Creaform has developed and sells the Handyscan 3D portable, self-positioning 3D scanners, the HandyPROBE optical portable CMM, the MetraSCAN 3D optical CMM scanners and the Go!SCAN 3D white light scanner. The company also offers an intuitive photogrammetry device: the MaxSHOT 3D optical coordinate measuring system. The company employs more than 300 people worldwide, and has offices in Lévis, Montréal, the United States, France, Germany, China, India and Japan. The company's head office and Quebec-based offices are 9001:2008 ISO certified. Strip System can be configured with 2 dual-wafer modules. Wafer Feeder offers on-line wafer expander option. Dip-Flux Feeder facilitates flip chip assembly.